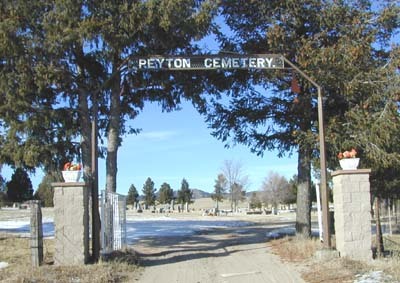 Peyton Cemetery is located approximately 16 miles east of Colorado Springs on Highway 24. The cemetery can be reached by turning north at the Peyton sign onto Bradshaw Road, following it as it swings west. Turn north at Manitou Street and proceed four blocks, turning left just past the school. Follow the road past the football field as it turns and reaches the cemetery gate. According to GPS-derived geolocation (accurate to 10 meters), the cemetery's coordinates are latitude 39°02'03.2"N and longitude 104°29'18.4"W. Sexton records are maintined by trustees of the cemetery: Lloyd and Helen Baber, (719) 632-5378. Ed Stone, (719) 749-2063, lives nearby and is available to provide information. The cemetery grounds are maintained by volunteers the Babers and Ed Stone. Cemetery hours and points of contact for information are posted just inside the cemetery gate. The cemetery overlooks the Front Range of the Rocky Mountains, has mature trees, and is well maintained.